Ted Donohue said that the idea for the fund originated from the comments made by Donohue’s friends from Dartmouth during her funeral. With Donohue’s zealous passion and pride for the school, Ted Donohue said it seemed an obvious choice to try to pay that spirited devotion forward. College spokesperson Diana Lawrence said Donohue’s friends and family approached the College shortly after Donohue’s death about developing a fund in memory of her. Currently, she said, there are no specific restrictions around the scholarship or stipulations about who would benefit from the fund. Lawrence said that scholarship funds are often established after the passing of a student or alumna, as a way to continue the legacy of a loved one. 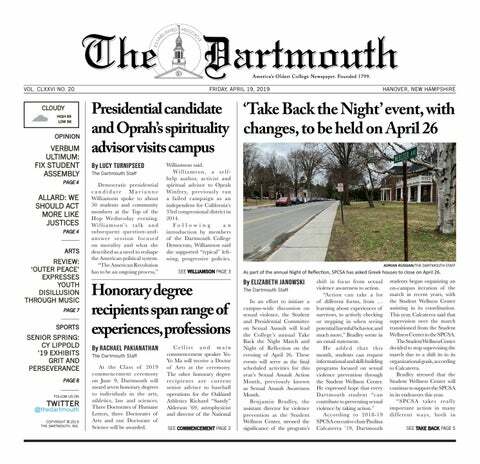 “Over the years, there have been many such memorial gifts, as families want to honor a loved one’s devotion to Dartmouth,” Lawrence said. The Donohues’ family friend Michael Marriott ’84, and the father of Alana Donohue’s close friend Dean Marriott ’18, is also intricately involved in the development of the fund. Like Donohue, Marriott said the formation of the scholarship was only natural given Donohue’s great love for the College. Michael Marriott described an instance when Donohue had just been accepted to the College, when the Marriotts and Donohues were together on vacation in Peru. Upon hearing the news, Michael Marriott shook Donohue’s hand and congratulated her on getting into “the best school in the country.” He said at the time she responded with her classic “Alana smirk,” probably chalking his enthusiasm up to being a proud alumnus and seeming to not entirely believe his words. However, he said after her first year at the College she had changed her tune. “After her first year or so, she came up to me and said, ‘Hey Michael, I just wanted you to know that what you said back in Peru, about the school — you were right,’” Michael Marriott recalled with a laugh. Ted Donohue said the scholarship fund serves to symbolize not only his daughter’s affinity for the College, but also her passion for intellectual pursuits and giving spirit. Marriott echoed a similar sentiment about Donohue’s intense love for knowledge. He said that when their families went on vacation together, the tour guides often liked her the best, because “she would ask the best questions.” He said the scholarship encompasses this intellectual eagerness. Ted Donohue said his daughter had spoken of giving back to the College after she had graduated, and that this scholarship will allow future students to benefit from the wonderful community the College provides, and to subsequently give back to it themselves. He added that it exposes “a little more beauty” of Dartmouth’s community, and the great things that that community is capable of producing. Marriott agreed. “It’s a very fitting tribute,” Marriott said. Lawrence said a scholarship fund requires a minimum of $250,000, although she said she couldn’t speculate on how quickly that could be funded.